The 2017 Honda CR-V and the 2017 Toyota RAV4 are both SUVs that commonly get compared to one another for their seemingly similar aspects. It can sometimes be difficult to see where one vehicle differentiates from another if you’re not paying close attention. However, we’re here to help with that. Keep reading to see which of the Honda CR-V and Toyota RAV4 has better interior space offerings. When it comes to interior space, the 2017 Honda CR-V simply has more of it; there’s no disputing the numbers. Passenger space on the CR-V totals 105.9 cubic feet, while the RAV4 lags behind with 101.9 cubic feet. Interior cargo space is also more readily available on the CR-V, with between 39.2 and 75.8 cubic feet. The RAV4 doesn’t quite step up to the CR-V with its offerings of between 38.4 and 73.4 cubic feet of space. The 2017 Honda CR-V is able to prove its superiority to the RAV4 beyond the realm of interior space as well. In fact, the CR-V is able to deliver a lot more to Illinois drivers than its opponent, and all at a lower price point. The CR-V is priced at only $24,045 MSRP for 2WD models,* while the RAV4 costs $25,410 MSRP—an unjustified increase considering the CR-V provides more than the RAV4. 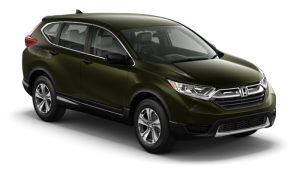 To start, the CR-V offers better performance with an engine that delivers 184 hp and 180 lb-ft of torque, better fuel economy, and a higher safety rating of 5 stars from the NHTSA. ** The RAV4 only provides up to 176 hp, 172 lb-ft of torque, lower efficiency, and just a 4-star overall safety rating—a large gap between what the CR-V has available. In addition to all of this, the CR-V provides more standard and available features than the RAV4. At this point, the choice should be clear; the 2017 Honda CR-V has much more to offer than the RAV4. With this in mind, it’s time to take a quick trip to your local Central Illinois Honda Dealers location to see the CR-V in action. You can also contact us online to learn about our financing process and current promotions. ***Government 5-Star Safety Ratings are part of the National Highway Traffic Safety Administration’s (NHTSA’s) New Car Assessment Program. For additional information on the 5-Star Safety Ratings program, please visit www.safercar.gov.